Snow, snow, go away ... don't come again until Christmas! Sunshine sparkling off the ice crystals on the dunes at Lewes Beach was a stunning sight when we stopped on way back from breakfast last Saturday. But I'm glad that we've had warmer weather the last few days and the snow has probably melted entirely, except maybe the massive plowed piles in the parking lot. Looks quite pretty though heheh! Gorgeous photo. It's super hot here in Perth at the moment and I would love to see some snow. Am totally with you on that one.... nice photo, though. hope it gets warmer, sooner!! I can't wait - it was 50 degrees today and we had a smidge of sunshine. The snow is still here though. Sick of wearing boots and a winter coat. 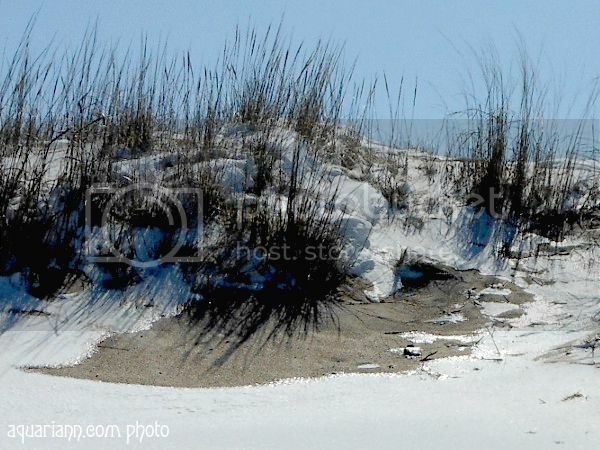 There is something really appealing about the sand and snow together in a photo. Our melting snow is creating a muddy havoc in my yard. If I lived where it snowed, I would be so excited to see it all melt away. I bet it's really fun to watch all the white disappear and see new growth underneath it all!